Americano vs Drip Coffee: What’s the Difference? Americano and drip are brewed in two completely different ways. In this article, I take a close look at the key traits that separate these two popular versions of black coffee. On the surface, they look pretty similar. Both are long and black, and both are just plain coffee. However, drip coffee and americanos are two entirely different beasts – each with their pros and cons. Some may prefer one over the other. If you’re not quite sure what the difference is then read on. Unless you’re from the planet Mars, you already know how drip coffee is made. So let me start by talking about an Americano. Espresso first, then diluting with hot water after. This will create a cup of coffee that looks exactly like a regular cup of black coffee. How much water is used in americano? The exact amount can vary depending on the location and the skills of the barista, but the general way is to pull a double shot and then fill whatever cup is used with water directly from the espresso machine’s steam wand. On the surface, these two kinds of coffee look somewhat similar. So what about the taste? An Americano, being a diluted espresso, will have a lot of the characteristics of the espresso, just in a thinned down version. In particular, this means that it’s often brewed with a somewhat dark roast. 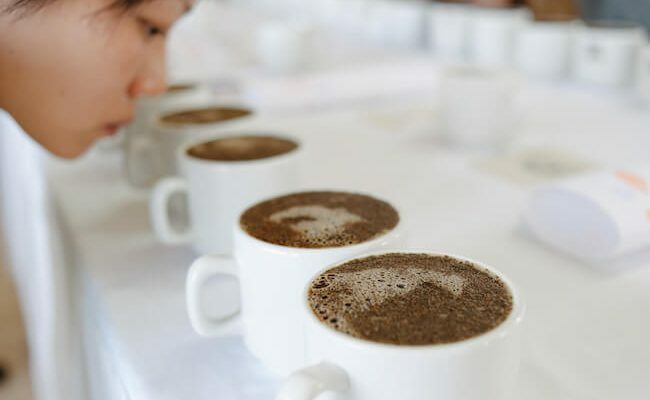 At the level of concentration that the Americano is typically served at, this will manifest itself as a slightly ‘roasty’ or burnt flavor depending on the quality of the beans. Being brewed with a metal filter, more oils will also end up in the coffee. Contrast this with the typical drip coffee that is brewed with a paper filter. This brew method gives a smoother more light-bodied cup of coffee. The character of the cup can be further enhanced with the choice of beans; often drip coffee blends, or single origin beans will be of a light or medium roast. The result is that drip coffee is often more acidic and nuanced in its taste, while the Americano will be perceived as stronger and bolder. So maybe you don’t care about the flavor and want a caffeine kick in the morning? Well, both drip coffee and americanos have around the same level of caffeine. According to USDA a regular cup of morning Joe has 92 mg of caffeine, while a double shot of espresso has around 120 mg. However, of course, these exact ratios will vary a lot depending on cup size and the precise ratio of ground coffee to water. Of course, you should also factor in how diluted the Americano is. If the only thing, you’re after is a stimulant to wake you up, then you might as well drink espressos. Why is it called americano? Caffè Americano means ‘American coffee’ in Italian. Legend has it that the drink was invented during World War II when US soldiers came to Italy and wanted a coffee similar to the one they were served back home. According to Wikipedia, this claim has never been confirmed. The Americano was already mentioned in a 1928 novel taking place in Italy by Somerset Maugham. It’s not clear, however, if this refers to coffee or an alcoholic concoction though. The latter could be the case since there is a pretty famous cocktail called americano that consists of Campari and Vermouth with a dash of soda. No matter, how the name came to be, it’s by far the most popular way to describe an espresso diluted with hot water in most countries in the world today. In Australia, the same coffee beverage is called a ‘long black,’ but otherwise, Americano is almost universally understood.